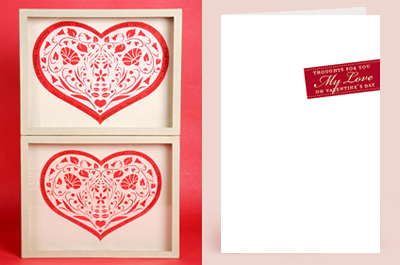 A couple of beautiful Valentine's Day projects you can make with paper: framed papercut hearts at Martha Stewart, and an elegant printable card from Emily Montgomery at Paper Seed. I love the simple design of this card, and that it won't cost you a whole ink cartridge. I think I'd use a smaller card to print that on. ;) Unless I had an awful lot to write on the inside, that is. Ahem. Yes, well. I already mentioned this on the wrong post, but the cut-out heart would make a terrific embroidery pattern - just duplicate and flip the design in a graphics program, put both sides together, and trace it onto fabric. I may have to try that! First I would say to thank you because the information you provide is very useful for us. And I hope you will continue sharing now in coming days.